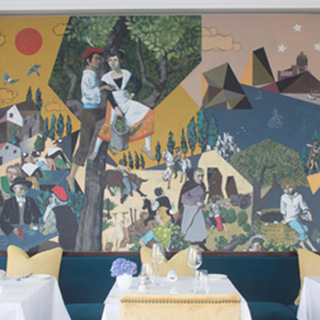 Chef de Cuisine Nicolas Cegretin, himself a son of Provence, has created an exquisite menu selection that is all at once nostalgic and yet sophisticated. 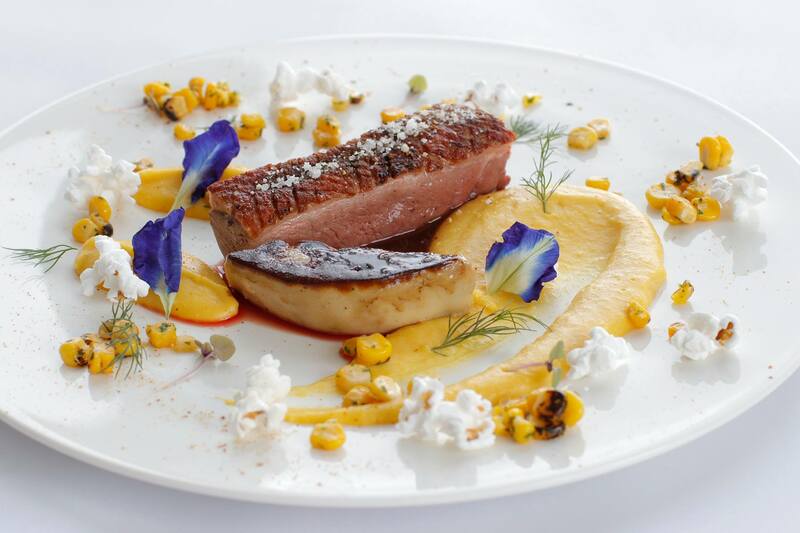 Provence is experienced throughout the cuisine in Mirèio through highlighting ingredients rather than technique. The restaurant's signature dishes, notably the Beef Tartare with Goat Cheese, and the Herb-crusted Sea Bass with Ratatouille-stuffed Cannelloni, focus on the ingredients' freshness, each element carefully sourced, prepared in an almost lovingly manner to bring forth all the nuances of natural flavor in every bite. Mirèio is named after the Nobel prize-winning poem by Frederic Mistral that tells the tale of young love and devotion through a journey of the famed countryside. Monsieur Mistral's own love letter to Provence. 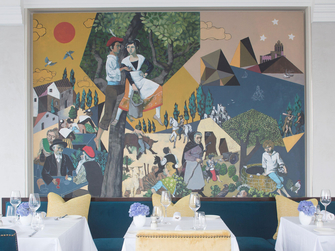 This love for Provence is prevalent not only in the cuisine, but also in the restaurant's art and interiors. 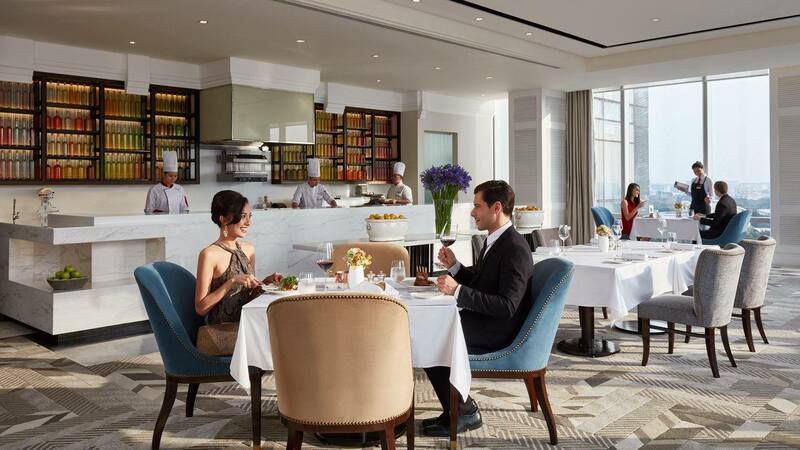 Aside from an a la Carte menu that changes with the seasons, Mireio offers an American Breakfast with a Continental Buffet, a daily business lunch set menu called Menu Dejeuner, and a family brunch on Saturdays and Sundays called Weekends in Provence. Apart from the sharing steak plate which we had to send back twice because it was cold it was a really enjoyable experience. Wine list could do with some more choice. Dining with you at your establishment was the best experience I have ever had in my life, in all my travels across the world. Coming from Canada, I am impressed! The service was stellar (I believe the young mans name was Romer). Your establishment is stunning and the food was to die for. I will be dining with you again every couple of weeks for the next few months while I am here in the Philippines. Well done - take a bow! Their a la carte breakfast is the best value for money in Legaspi village. Ordered the bouillabaisse and the soup was excellent, but the portion was slightly small. If only there were more pieces of fish in it, it would have been great. Otherwise, service and the bread offered before the main dish came were excellent . This is probably the  best fine dining experience I’ve ever had. The staff were courteous, friendly and always greet guests with a smile. Mireio has a lot of selections for food and wine. Food arrived on time and most importantly delicious! This restaurant also gives excellent views of the city skyline! I previously enjoyed eating the tartare steak which unfortunately is no longer on the menu. After asking the Chef, the young waiter confirmed that this dish could still be made. So I ordered it. Unfortunately it contained a lot of mayonnaise. Also the house bread was no longer like before. The salmon tartare was ok. My wife was not too happy with her squid whereas her friend like the salmon steak. The service was good, but not the same when Restaurant Manager was still there. Actually I would expect a senior waiter for a restaurant of this upscale restaurant. The apero on the terrace was refreshing as usual, but the music was a bit too loud. I patronized the Mirèio a number of times in the past, especially during the time of David Batchelor. Superb experience, service excellent as well as the food. Chef Herve and his team have put together a tremendous Sunday brunch experience. We will most certainly be regulars from now on. Service from Avegail was good. Would be nice if you can add like a huge fan specially now that it’s summer but aside from that, everything was perfect! Louise gave excellent customer service. :) Thank you Mireio! Good food with excellent service! Always enjoy the atmosphere, the view and service of Mireio! Fantastic service and great view. I celebrated my 18th birthday here. We did the golden hour at the Terrace, and had dinner at the restaurant. Our experience, both at the Terrace and in the restaurant, was wonderful. The cocktails were delightful, even more so accompanied with their selection of pica pica. The music was the perfect mix of old school and modern. I, personally, love 60s-90s music, while my friends enjoy more modern music, and we were given the perfect blend of both. The ambiance and the overall feel of the place, however, was my favourite part. It was very classy, very sophisticated, very elegant, but very exciting. It was a place that I believed really relfected my personality. At the restaurant, we had various dishes: Niçoise salad, Tagliatelle with lobster, Salmon, Angus Steak, Oxtail, Duck with Foie Gras, and Chicken among others. The food was two hands up in the air SPECTACULAR! All of my guests and I enjoyed the gastronomic experience. Some of my guests experienced the Provençal cuisine for the first time on my birthday, and they had the most pleasant experience. The place was perfect for the classy and intimate celebration that I wanted. The waiters and hostesses were very courteous and very pleasant. They really made me feel even more special with the way they treated my guests and I. The servers were truly very well-bred and had lovely personalities. I also loved how it only took me a couple of emails and short phone calls here and there to plan my entire celebration, as the staff were very efficient and paid attention to what I wanted. Mirèio is truly the best fine dining restaurant in Metro Manila for me. I’ve always loved having lunch here with my mom, but I love it even more now. I love the restaurant and it's great value for money. a very enjoyable evening with top class food and wines made all the more enjoyable by the delightful staff including thomas and michael and all the others with a very polished and friendly service and  environment just top notch. looking forward to another special evening like this. We had dinner with MIchelin starred Chef Benjamin Colombat on the 19th. The restaurant was noisier than usual. The waiters were attentive but we did not get the customary introductions to the menu after the dish is served like we usually get in other Michelin starred restaurants abroad. The service was prompt but you can tell the movements and manners were less refined. The food was underwhelming and the wine pairing was contrived. Mireio on ordinary nights would get a higher rating from me on food, service and ambience.